For a limited time you will be able to purchase four popular tree artworks as a collector's limited edition signed and numbered prints. These prints will make a perfect gift for events such as a birthday, wedding, anniversary, or baby shower. You can have it shipped right to the precipitant's door, gift wrapped with a greeting from you. Just let me know if you are sending as a gift in the notes during checkout. "Sweet Dreams Tree" Original is sold, but is available as an 8X10" limited edition signed print of 50. "Pair Tree" Original is sold, but is available as an 8X8" limited edition signed print of 50. "Elephant Under a Blossom Tree" Original is sold, but is available as an 8X10" limited edition signed print of 50. 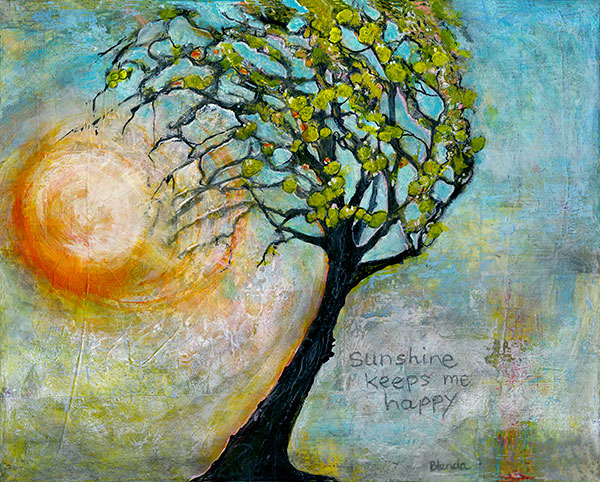 "sunshine keeps me happy" is available as an 8X10" limited edition signed print of 50. Purchase the original painting here. Each one of these prints is printed right in my studio.I personally sign, number and inspect each one for quality and color. They are printed on a high end Epson printer using archival giclee inks and 340gsm fine art paper. It's thick, like watercolor paper. Be sure to order your limited edition print today. Supply is very limited! In other news, I hope you have been enjoying these last few days of summer. Fall is right around the corner and I can feel it in the air, can't you? Here in the Pacific Northwest we finally got rain after a very long hot crispy dry summer. How about you? What has the weather been like where you live?